So. We had this tree. It was beautiful but was a house killer so it had to come down. I hate when trees have to come down. The tree guy says to us at the time (a few months ago) “Do you want to keep a tall stump I know a guy who carves trees.” We said yes. We called this guy up several times. Only this tree carver never called us back. Good thing in the end, because our tree was carved by the person I think meant to carve it. Around the same time Carver “X” wasn’t calling us back, friends in Phoenixville had a giant tree carved. It was amazing. We asked them who they used. “Marty Long” they replied. So we called him up. He asked us to look at his website to see if what he did was to our liking. I think it took five seconds of looking at his website to say “oh yes, please”. This was tree carving I had never seen the likes of. 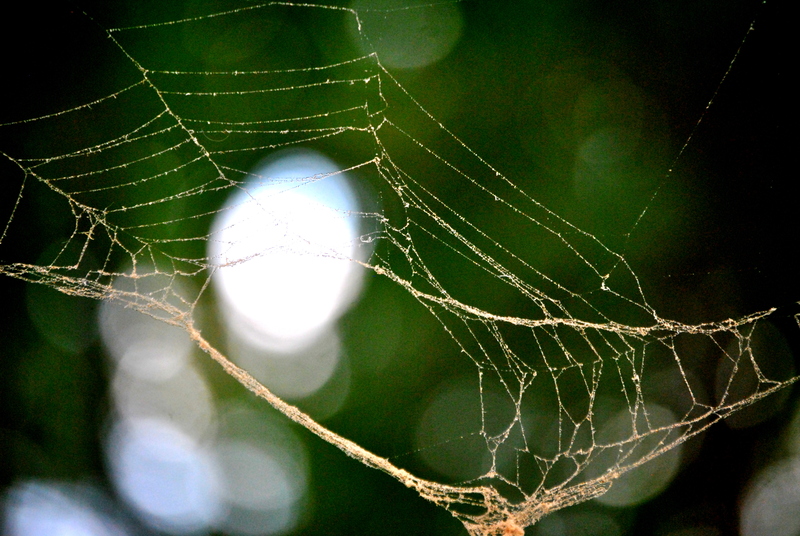 It was fully sculptural, often lyrical and even fey. I have a friend from high school who is a marvelous sculptor, so I appreciate the craft. Marty said he would fit us in when he had time. 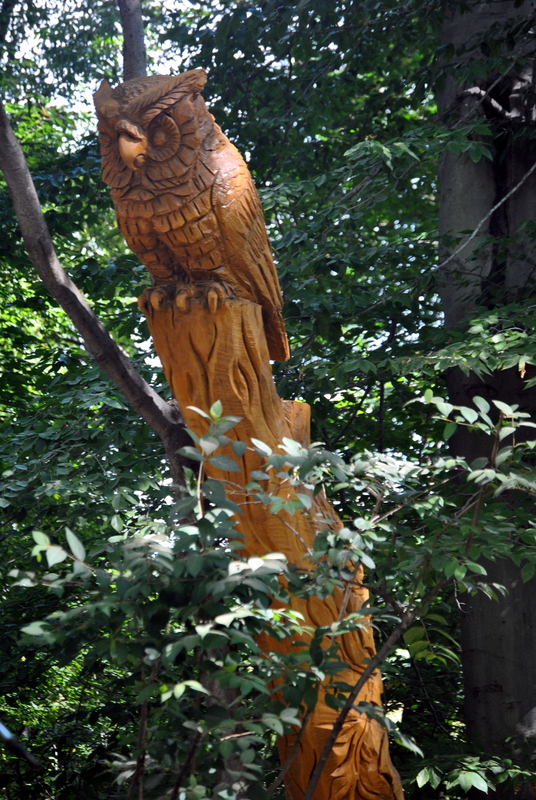 Summer rolled through and I began to realize that some of my favorite wood carvings I had seen out of trees were his creations. 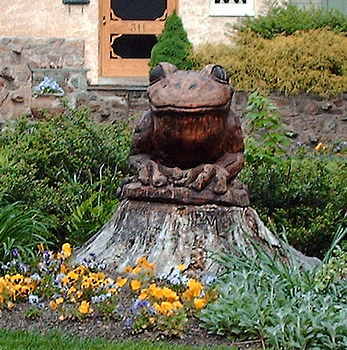 The giant frog in North Wayne. The rabbit totem pole on the Haas Estate facing County Line Road in Villanova. And many others. It ends up that all of the wood carvings I really like are his. 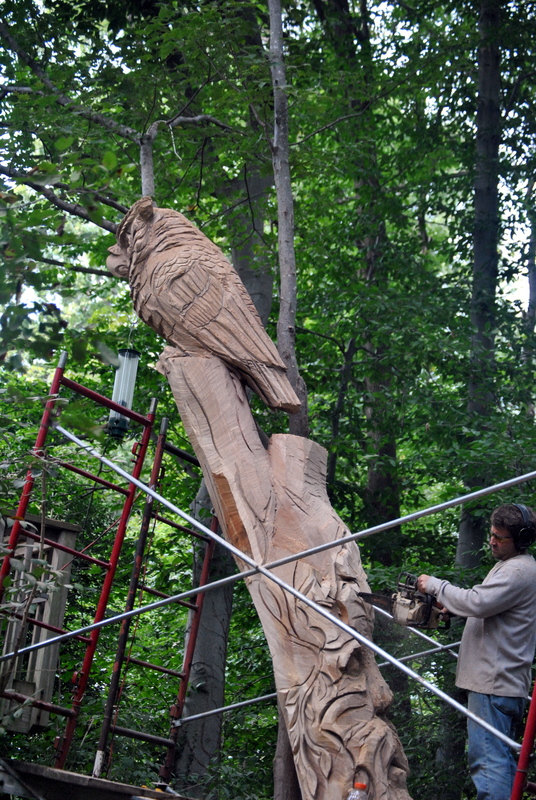 Tree sculpture creates a buzz A dead white oak is transformed into art with a children’s theme. 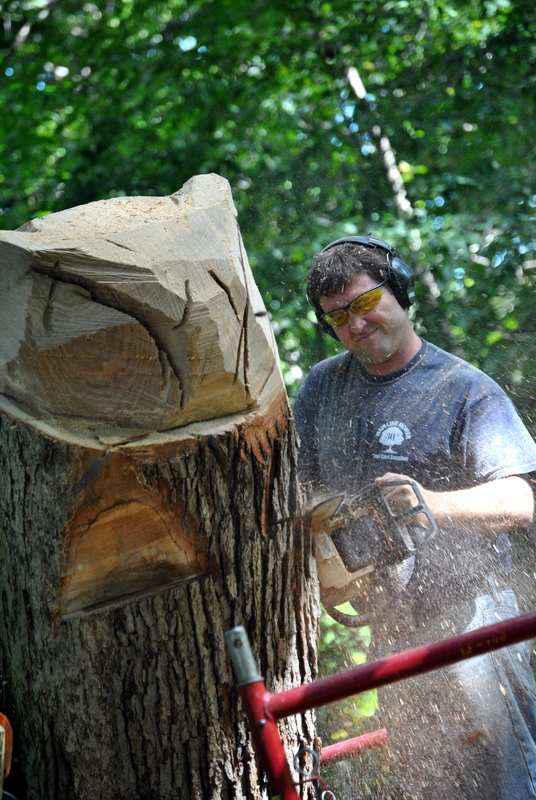 High above the road in Villanova, what’s left of a giant oak is becoming chainsaw art. 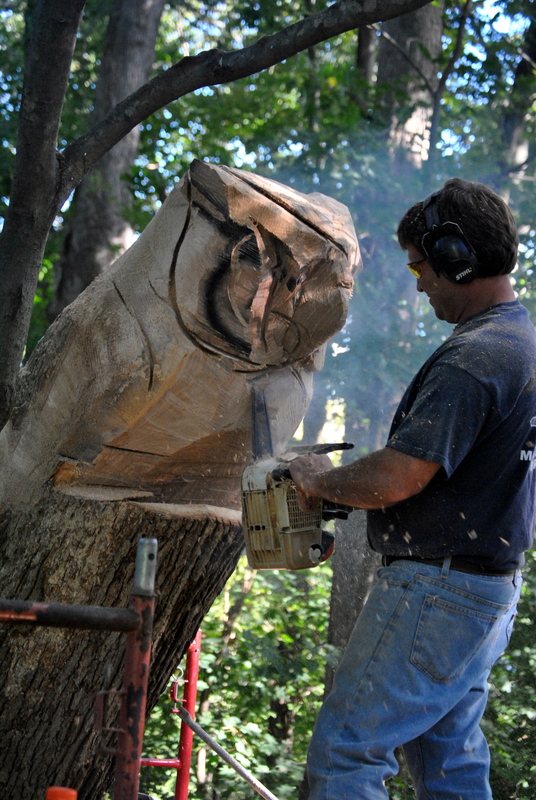 Marty Long, an ice sculptor turned wood carver, slices away at the 12-foot-high trunk in front of an orthodontist’s home at 91 N. Spring Mill Rd. As chips fly, three figures emerge: a boy climbing the trunk, a girl resting halfway up, and a teenage boy, with arms raised, exultant at reaching the top. “It symbolizes the different stages of life – the small child and the teenager. The boy has worked really hard to get to the top of the tree,” says Anthony R. Costa, 42, as he and wife Cole, 30, peer up at the work they’ve commissioned…. 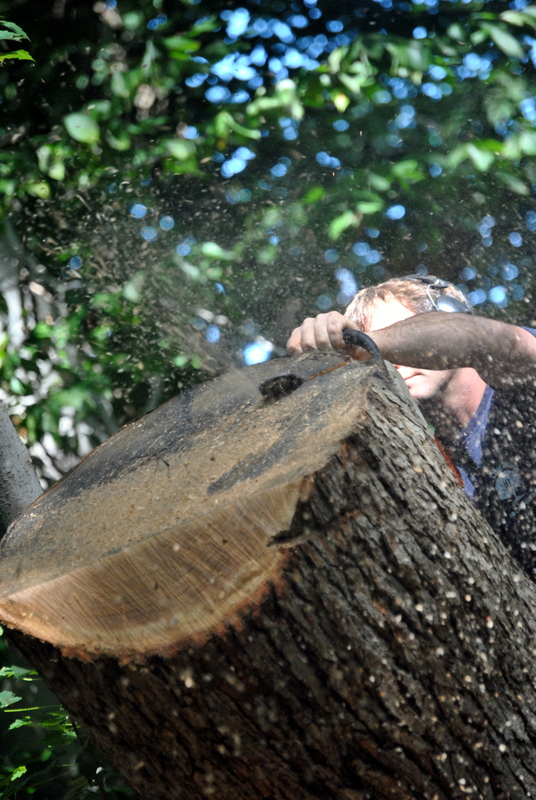 Long began whittling tree trunks, mostly for affluent suburban homeowners. Word spread, and Long found himself earning a living as a tree carver. Some of the figures stand alone. Others peek from holes in a “tree.” The carvings can be seen outside homes, retirement facilities and schools; there’s a bulldog outside Charlestown Elementary School, which sons Jack, 9, and Ryan, 7, attend. He called us a week ago and said it was time. I was so excited I think I was probably a bit ridiculous to live with. Marty and his assistant John showed up and he asked me what we wanted, or should I be more specific, had what we wanted changed since we first met with him. I said nope and said the end result would be up to him as the artist. I figured the wood would tell him what it wanted to be as he got into it. 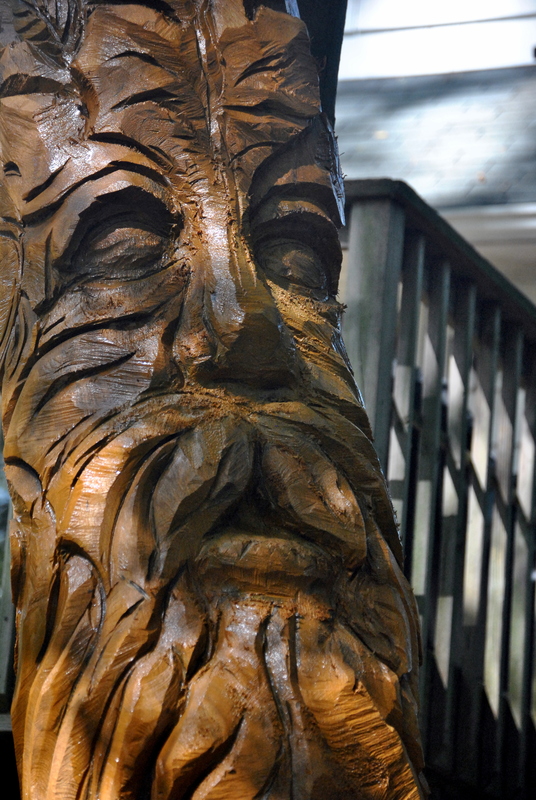 From the body of a tree formerly known as a GIANT RED OAK has arisen this amazing sculpture. It’s like a totem pole and it is awesome. I have the ultimate owl on one side guarding over us and my garden, and on the other side of the tree is a wood-spirit who must have a green man as a cousin. He gazes out at us with knowing all-seeing eyes and his hair and beard are partially made of leaves. I find myself just staring at the tree. Marty’s work is simply amazing and very beautiful. 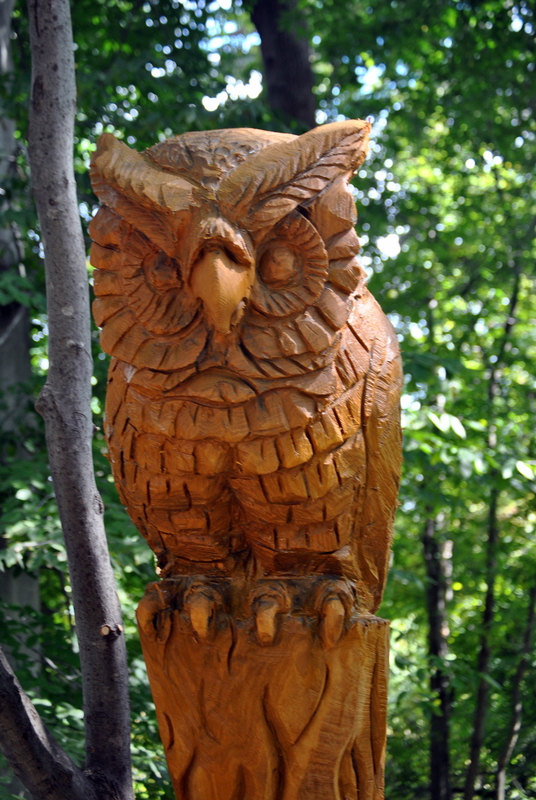 His tree carvings are raw energy and then they flow into these amazing creations. They are indeed pieces of art if you let him go with the flow of his creativity. If you want to connect with Marty, here is his website: www.martylong.com. 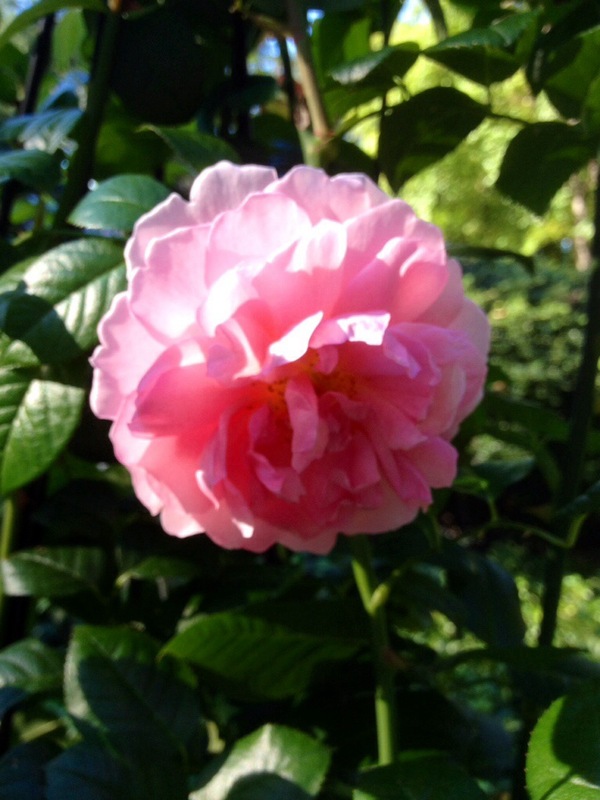 Tell him you read about him on Chester County Ramblings. If you want the most amazing thing ever, this is your guy. 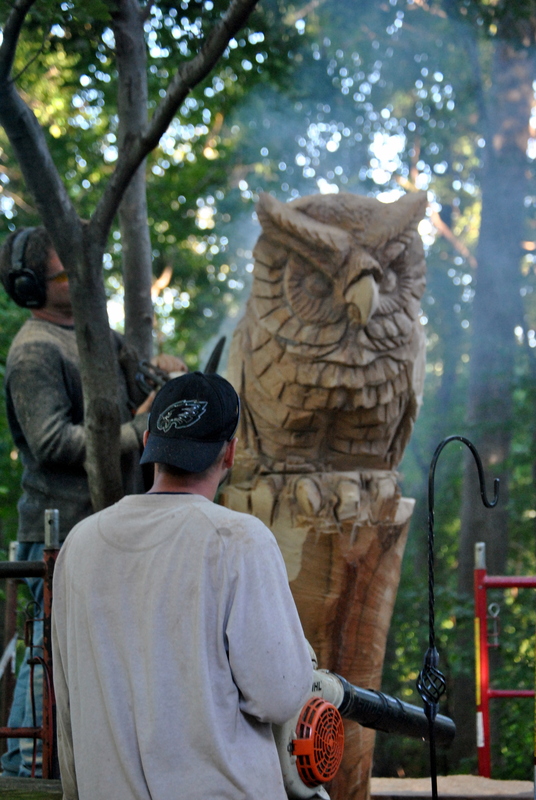 Chester County has some truly amazing crafts people and artists. I think this thing is so cool that I need my own druid…..
why not say who you are? First Lady Michelle Obama. Photo taken by me in March 2008. Yes, I was that close and this is among my favorite candids I have ever shot. The political process always has and always will fascinate me. I enjoy being a student of politics, so to speak. I came from the Main Line where it can be said when it comes to all things local politics, well it is different. It is also nasty and cut throat. Hope Chester County doesn’t prove to be the same. I will look to the person behind the candidate to help me decide. I will also speak to candidates and see what they are about. From First Lady Michele Obama to Congressmen, to State Representatives, to State Senators to U.S. Senators to Supervisors and Commissioners, I will talk to them all. I figure why not? They want my vote, right? Why shouldn’t they talk to me? They are just people, after all. 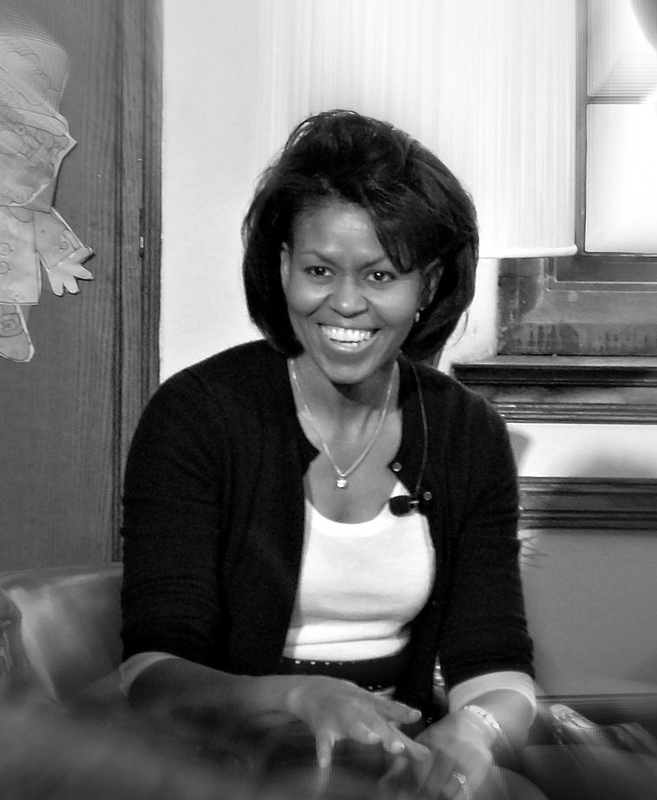 The photo above is of the current First Lady, Michelle Obama. I met her in a small setting in 2008 – and to this day I still enjoyed interacting with her. Not so fond of how her husband has done his job, but honestly? She is pretty cool. Sorry if that upsets my die-hard conservative friends, but it is what it is. I can still enjoy liberals as people on occasion. The heavens won’t open up and smote me. I do not donate to political campaigns. I don’t believe in it. I believe our political process is broken. I believe at times power corrupts. But I do ultimately believe in the process. And that we as citizens have to keep participating. I believe extremism in U.S. politics is ruining our political system. I see it reflected locally in Chester County in a sense. I do not see that as a bad thing, incidentally, what bothers me are the Chester County Democrats I see running for office right now who seem unable or unwilling to put out there their party affiliation. If they are proud to be a Democrat, why don’t they say so? Are they embarrassed by their national party? I started nosing around about this last spring when I saw “Julia4Judge” signs. At first I was amused. I had no clue who this person was. Did she think she was like “Cher” or “Madonna” and only needed one name? You know like “Judge Judy” of television fame? Or was she trying to appeal to the tweeting and texting set? I did not know what her affiliation was until I went to the Chester County Democratic Committee Candidate page. I could not find it on her “blog” (not sure she actually writes it as it reads like a campaign is writing it) , her website, or her Facebook page. Realistically how many average people are going to do that? Search out a bunch of stuff until they see the party affiliation? They look at the mail drop literature and the palm cards and are done with it aren’t they? Now I have not seen Julia Malloy-Good’s mail drop literature yet or a palm card, but I have seen another running Democrat’s palm card and website and don’t see his party affiliation either – Bill Holmes the guy who wants you to “get on board with Bill.” (Choo Choo he needs a conductor’s hat, right?) 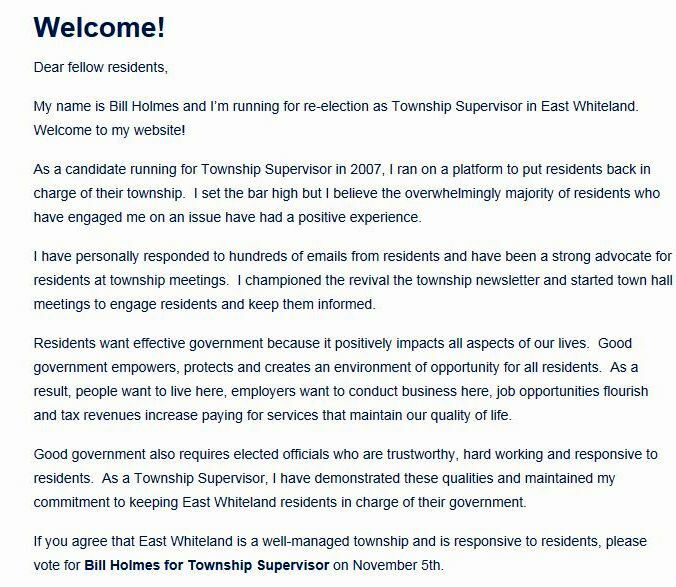 He is running for Supervisor in East Whiteland. East Whiteland has a Democrat majority on their board of three in East Whiteland I think. I know that Virginia McMichael who is Holmes’ “honorary campaign chair” is a Democrat, so theoretically wouldn’t Holmes be proud to say on his palm cards and website her was a Democrat since they appear to control the political majority on the Board of Supervisors of East Whiteland Township in a Republican dominated county? Now putting aside the fact that this “welcome” to his website is not exactly humble or self-effacing, why not say political party affiliation? And wow, if you go further into his campaign website you will note he is an IT professional. So one would think that East Whiteland would have a totally fabulous, easy to navigate website, right? I don’t get it. I have a lot of friends who are Democrats, they aren’t afraid to tell you their party affiliation in the least….even out here in Chester County. But political candidates for public office who can’t seem to disclose this stuff on palm card, websites and whatnot? Why should I consider them? In my mind that gives me something NOT to trust. Even when it comes to politics, say who you are. Be who you are. Hiding it or omitting it deliberately on literature, websites and palm cards leads to people mistrusting candidates, so if you are a Democratic candidate in Chester County, please say so…unless you are of course embarrassed or ashamed? Then you might consider Republican or Independent status, right? Just something that bugs me. save the barn (easttown township)- important october 3rd meeting! I have written about residents trying to save this historic Chester County barn before. Twice as a matter of fact. Here is a flyer that was sent to me about an upcoming zoning meeting on October 3rd in Easttown Township. Apparently the developer (Bentley Homes) is seeking a demolition permit now I presume. Not shocking after that fabulous effort to market the barn to a new owner, right? And the thing is this: this barn has had restoration to modernize it and is in good shape. So why wouldn’t it sell unless it wasn’t really ever marketed? Why not make the barn into a house as part of this development? Oh never mind, why ask redundant questions. A historic barn means nothing to Bentley Homes, does it? They are, after all the people who took a heck of a lot of forest off of Forest Lane (Willistown Township, Malvern), right? 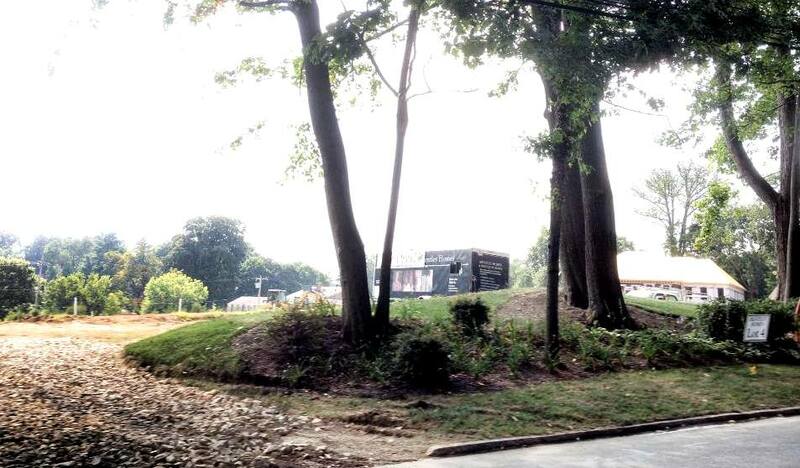 The people who have done the same de-treeing thing on County Line Road in Radnor Township, right? This is a sin if this barn gets demolished. If you can help or know someone who will buy it, please go that meeting. You can always build another Tyvec wrapped box. Structures like this barn? Not so much. We need to preserve history like this. And this is perfectly adaptable to modern use. This developer has more than enough jingle in his pocket that he could either sell or reuse this barn if he wanted to. Once again I reiterate my plea to residents in Chester County to lobby any elected official they can to slow down development in the county. Prior to being a stepmom in Chester County, I spent years in the financial services industry including as a Compliance Officer. So I am very familiar with how banks and other institutions should send out customer correspondence. This morning as I am editing some photos the doorbell rings. A UPS man had dropped an envelope on the front porch. The envelope is from Citibank, N.A. I opened it not thinking initially it could be addressed to someone else. We don’t have accounts with Citibank, so I did not know why they were contacting us. Turns out the correspondence was for a woman who used to live in the house, but had been dead for close to three years. I start reading this letter addressed to the “Estate of Mrs. X” . They (Citibank) open by extending condolences a few years too late. Then they state how they have closed the account referenced above (I whited out the number for this post, but they disclosed the entire account number of this credit card) and apologized for any inconvenience and if anyone in the house was using this card they can call 1-800-456-4277 to apply for their own card. Then they say if the records are incorrect and Mrs. X is still alive, accept their apologies and basically let them know to reactivate account. They sign the letter Credit Management Department 1-866-775-0556. 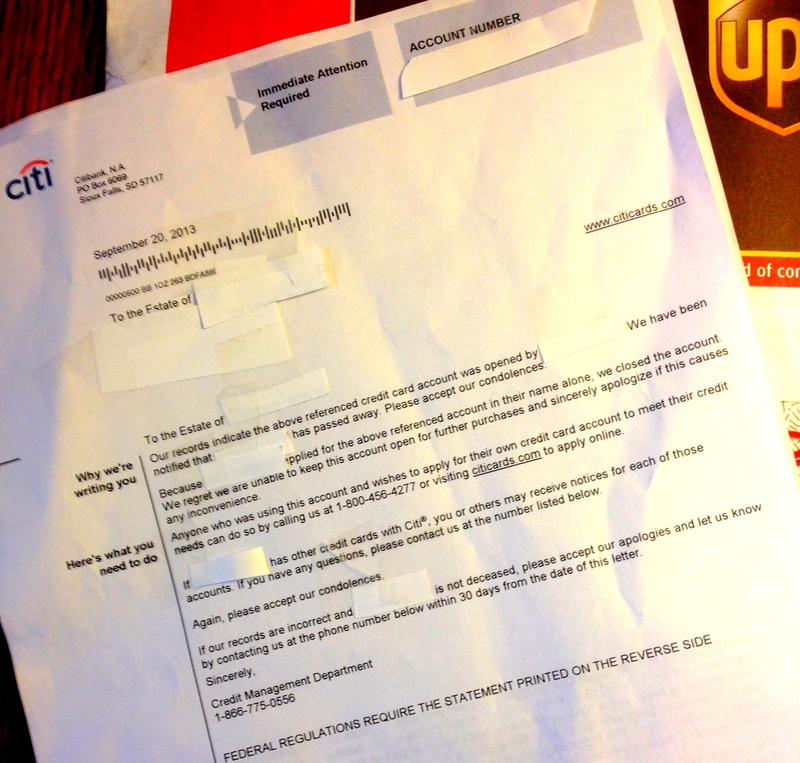 So I call up Citibank to (a) tell them they are sending correspondence to my home to a woman who has been dead quite a while and to (b) to ask them to correct the address of record. I get a “helpful” customer service representative who says they found out only recently this woman had died due to another account she had with Citibank. O.K. too much information. I am not a relative or estate attorney or executor and if I was I should have to be able to give them proof of such standing before any conversation took place. So I said to her I had not received other correspondence from Citibank so why would they send account information here when they had another address for whatever the other accounts were? Very annoyed. I had some nerve asking a reasonable and logical question. So I then told her how distasteful in general I found the letter along with foolhardy. Foolhardy as they disclosed to me a stranger an account number and did not verify a proper address for estate paperwork before sending anything out. Distasteful because they are on one hand offering condolences but on the other hand pimping for new customers, but oh yeah if Mrs. X really isn’t dead let’s get her hooked up with more credit again. So here’s to you Citibank. I don’t think I could ever open any account with you given this whole thing. I want my financial institutions to safeguard all my information, and if I had any deceased relatives where I was executrix, I would want the same thing. Financial institutions are sloppy. They have rules and regulations they are supposed to follow with regard to client accounts, and once anything gets tagged “estate” they are supposed to be even more vigilant. Aesop’s moral to this story is make sure accounts are CLOSED when you close them. 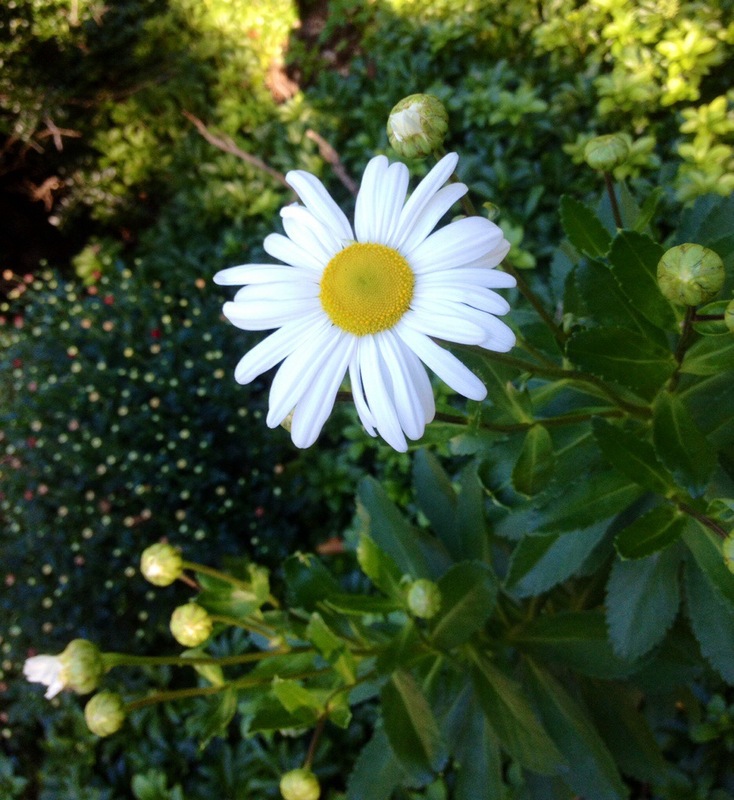 The fall flush of flowers has begun! I think this is my reward for planting 300 bulbs yesterday. what does AOL Patch actually cover? When I first started reading Malvern and West Chester Patch a couple of years ago I was impressed. They were actually living up to AOL Patch’s mission statement or whatever of covering local issues important to residents, in other words they were actually doing hyper-local news coverage. At that time they had a terrific regional editor and hard-working individual site editors. What has evolved to present day is somewhat disappointing. Quite a few changes in individual site editors and a regional editor who sees big news as things like what the best diaper is. Not that diapers aren’t important to moms everywhere, but are they hyper- local newsworthy? Malvern and West Chester is a fairly large area to cover with multiple municipalities representing zip codes 19380 and 19355. I want to acknowledge that up front. But it seems to me that news in West Chester and Malvern is not being covered and that is not good. Many Municipalities out here in these two zip codes do not have any televised meetings even if they could if they wanted to. So we depend on local and hyper-local media for coverage. And I don’t see this gap coverage on Patch. What I see is a lot of fluff and things re-posted from other Patch sites that are not necessarily newsworthy. 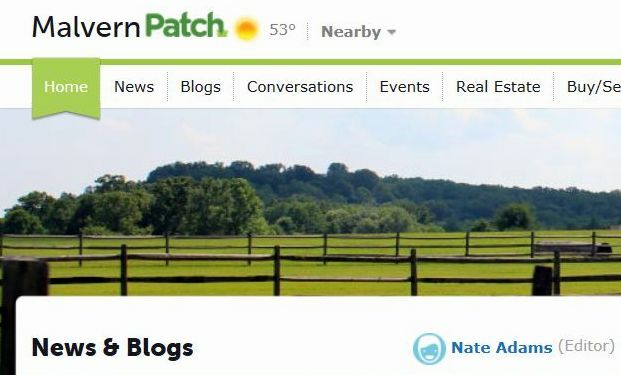 What do you think of Malvern and West Chester Patch and the current editor who is covering both sites? 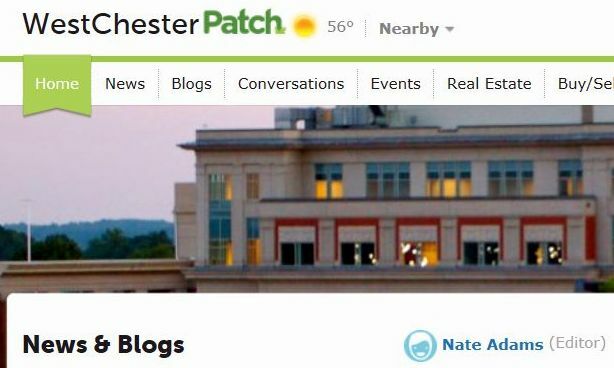 Are you disappointed in Malvern Patch and West Chester Patch? There is a lot going on out here, and while no media outlet can cover everything, in my humble opinion they should be covering a fair representation of news in the communities under the “Malvern” and “West Chester” umbrellas. What was the impetus of this post? Not just one thing, but a culmination of many things. Take for example a recent article from Abington Patch cross-posted in Malvern Patch on September 16th titled Forty-Six Parishes Under Archdiocese Scrutiny. This article was basically a republication of a Philadelphia Inquirer report. Furthermore, Patch references affected parishes in Bucks, Delaware, and Montgomery Counties. Not one word about CHESTER County, so what was the point of putting this on Malvern Patch? And then there is the STILL uncorrected spelling error in an obituary headline. I wrote about that on September 18th I found it so sloppy and disrespectful to whomever the deceased was. There are many other examples I could cite as disappointing, but I won’t. You all get where I am going. Do you think Patch has lost its way? What do you want to see coverage of? My list includes (but is not limited to) coverage of local meetings and issues facing residents, information on candidates for upcoming elections, real coverage of local businesses, meaningful profiles of residents doing terrific things, and coverage of local sports that is not borrowed or regurgitated from other sources. It would also be helpful to see our local Patch editor out and about covering some things, because as it stands I do not see where this guy has actually visited our communities. And face it, if you are going to cover us in a hyper-local manner you have to get out and explore. And face it, Chester County has a lot of cool things to cover in addition to local government and other issues which may not be considered so positive. At the end of the day, I would like to see Patch in Malvern and West Chester to once again cover where we live. They have employees being paid to do this, right? Why can’t they cover the area like Radnor and Tredyffrin Patch sites do? And if AOL Patch has changed and will no longer be covering where we live, it would helpful if they just said so. Also to consider is what is the future of journalism? Once upon a time we thought it might be AOL Patch.